2018 has got off to a flying start for us with lots of happy, newly-engaged couples getting in touch and the start of our #weddinginspo Showcase! With a busy and varied past 12 months, we are excited to see what this year will hold for the world of weddings! Looking back at 2017, we saw huge trends throughout the year with acrylic detailing, flower installations, Prosecco trucks and donut towers all making their way in to the most popular trends of the year. 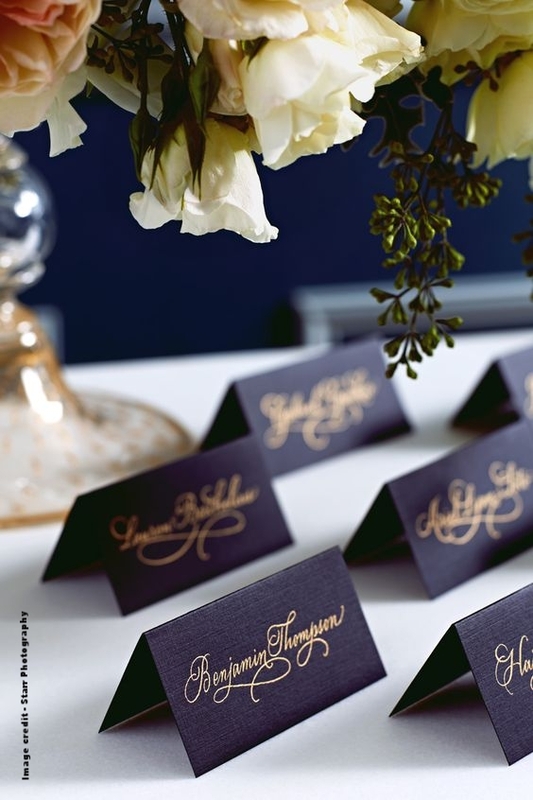 The concept of the D.I.Y wedding was strong and we saw couples making use of our A-Board and mirror for signage and table plans, as well as making their own table numbers and personal touches to add to the decor throughout the venue. Pastel shades and dessert tables were also popular wedding trends in 2017 which made for some stunning set ups, fantastic photography and cherished memories throughout the year. We have been looking at the wedding industries predicted trends for the coming year and are excited to see some of these make their way to the Granary Barns very soon! Hanging florals, foliage and potted plants are predicted to be huge this year. 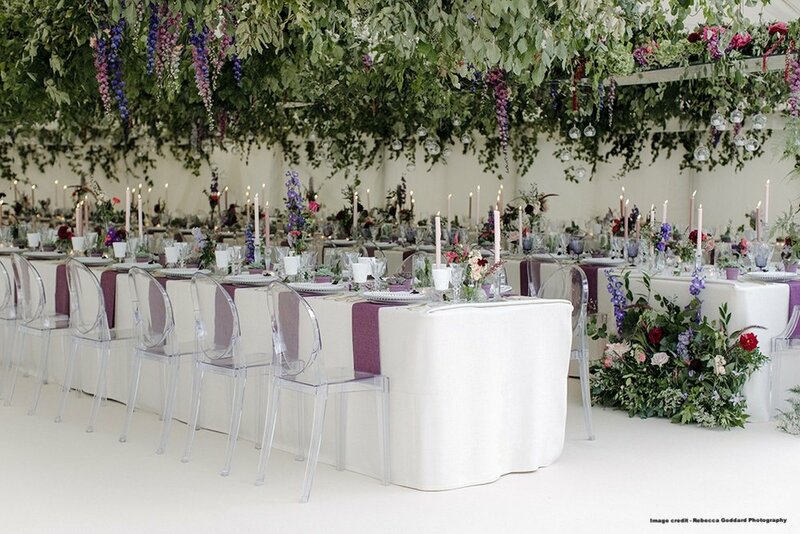 With lots of greenery and wild flowers making their mark in last years wedding trends, these look to be staying put and developing with more varied and elaborate ways of displaying these through the use of suspended structures and colourful, ornate vases. Being big fans of this type of floristry, we think colour bursts of green sit very well amongst the flint and wooden features in the barns and cant wait to see how our 2018 couples choose to display this part of their wedding decor. Metallics and sequins were a huge trend in 2017 and we don't see this changing any time soon! Copper detailing looks to be a strong trend that will be sticking around as we move in to the new season, but instead of 2017's choice of rose gold, we believe silver and chrome will be the metallic of choice this year as they compliment 2018's colour palette beautifully. This leads us rather nicely on to the predicted palette which consists of ultra violet, deep shades of purple, pearl and hints of black/navy - dreamy! Wedding capes and separates for bridesmaids are the predicted trends with regards to what to wear this year. As capes and separates became quite popular over the past 12 months, these choices will continue to grow and we for one love them! Separates are a great way to keep an aesthetic running throughout the bridal party, yet allow each of your squad put their own stamp on the day, perfect! Of course we cannot forget our grooms and the groomsmen...this year, black tie and the classic formal look, along with checks, are making a comeback in a big way. When it comes to table decorations, 2018 will see a desire to have as many textures as possible, mixing course linens with brightly coloured candle wax and ornate, embellished glassware. 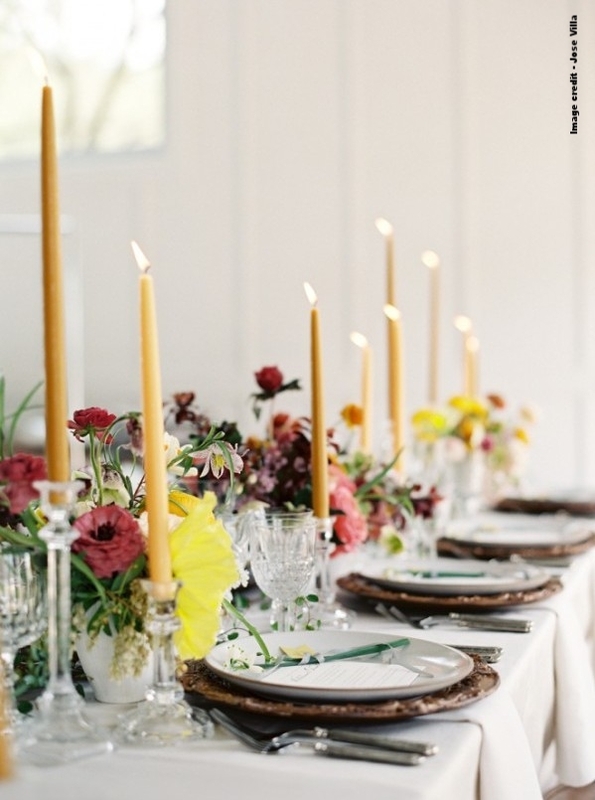 This makes for a very interesting and diverse decor, enabling couples to put their own spin on this part of the celebrations - an easy and potentially far more affordable option for your wedding breakfast theme, as this gives you the control over what items you are sourcing if you were to do this on your own. As we saw in 2017, couples are seeking new and more diverse venues and spaces in which to get married. This is continuing in to 2018 with the demand for open space and an abundance of natural light being at the top of many couples wishlist. The term 'rustic' has now been replaced with 'woodsy' to describe a relaxed and authentic wedding with an aesthetic based on all things natural, bringing the outdoors in. We see this a lot at the barns and cant wait to see this continue with a new twist as the new season approaches. Eclectic food menus, dessert stations and punch cocktails have all been tipped as the new food and drink trends of the year. Dessert stations give caterers/stylists the opportunity to get creative and personalise your food to match the rest of your theme which lends perfectly to the overall look of the day. As couples are getting more creative with their big day, so has the food options available to them. Whilst many still choose to go down the traditional route of a three course meal, others prefer to try a different approach which brings a great variety to the industry and the running of weddings here at The Granary Estates - we love how different each menu can be! Older PostAnother year to remember!